Beginning in 1947, the Bastian Brothers Co. of Rochester NY. began making Pit Badges for the Speedway. Their name or marks/logo(s) are located on the back of all the badges they produced from 1947 through 1985 EXCEPT 1961, 74, 75 and 80 through 82. The 1947 badge depicts the #2 Novi driven by Ralph Hepburn to 1 and 4 lap qualifying records in 1946. “1947” is on the back which is the ONLY time the date is not on the front of a badge. The pin and clasp are much heavier and sturdier than the "safety pin" type from before. It measures 2" x a little under 1" from helmet to the bottom of the number. It is estimated there were *1250 to 1500 silver badges produced and probably *6500 to 7500 bronze. 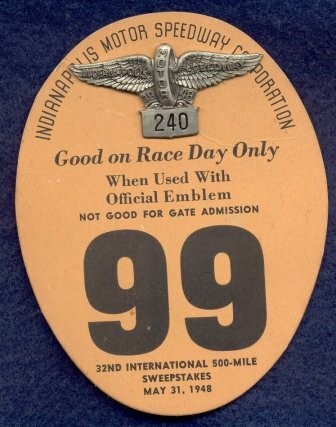 The 1948 badge measures a little over 2" x 1" and depicts the famous "Wing and Wheel" which has been used by the Speedway in one form or another since 1909. Note that the silver badge has an indentation to the back where as the bronze does not. It is unknown why this was done but it may be due to the composition of the metal and its softness. *In 1947 and 1948, badge numbers 1 through 50 were Gold Plated by either Tony Hulman and/or Wilbur Shaw and would've been issued to high up officials or employees, close friends, etc. of the Speedway. The 1948 does not have the indentation on the back indicating it is a bronze badge which has been plated. The 1949 badge is the wooden Pagoda which stood from 1925 to 1956. It measures a little over 1 1/2" x a little under 1 1/2". Badges from 1947 through 1949 are hard to find with the gold plated 1947 and 1948 badges the toughest to find then the 1947 silver.